Letterpress printed cover (with cover flaps that tuck in to make the softcover extra sturdy and add heft). Letterpress bookmark. 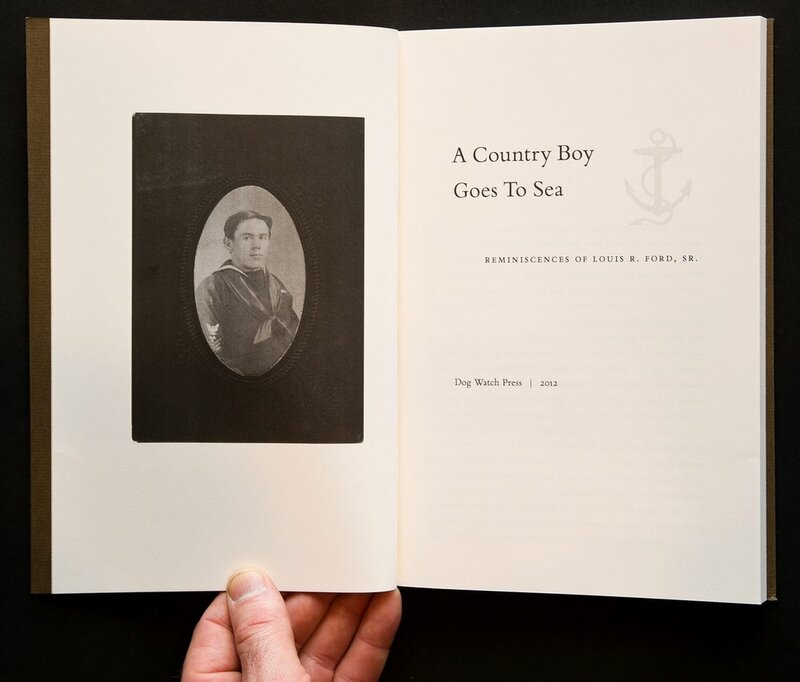 I LOVE WORKING ON THESE PROJECTS—creating beautiful book editions of memoirs/autobiographies/family histories; and working directly with authors (or their relatives) in a collaborative manner. It is incredibly satisfying to show there is a more fun and rewarding route than the Lulu and impersonal online "shove everything into a template" approach which don’t offer much in the way of choices of materials and results in uninspired, mediocre books and a cold, detached working process for the author. The interiors are digitally printed to keep costs down, but I use higher quality, thicker paper to make for a more engaging read and to emphasize the long-lasting importance of the books. The covers can be hand-printed in house on the letterpress to create a tactile impression for the reader to experience with their fingertips. While the books utilize a simple and inexpensive machine bound glue binding, the covers feature French flaps to give the paperback books more heft and to protect the books' foredges. It is also possible to create a small number of hand-bound books if desired and the budget allows. The most important thing with manuscripts written with this much care and love, is to create a beautiful design. Additionally, the image restoration and editing skills I am able to provide ensure that even lower quality photographs and images will reproduce beautifully. A wide range of printing and binding options, as well as assistance in editing manuscripts, are available for memoir books editions, so that we find the sweet spot in balancing special production touches with economic realities and tailor each project to its unique situation. Projects like these are important, as people share their life stories—often experiences they haven’t shared otherwise—and I help them turn their manuscripts (or oral interviews) into physical, cultural artifacts to share with family, friends, and colleagues. This act of preservation helps families understand where they came from, and more intimately understand the experiences and accomplishments of their family members. Books are still the best and longest lasting way to do this, and by creating beautiful books it helps ensure the stories will get passed down to future generations who may not get to know their ancestors. I work for a slightly discounted rate on these type of projects because I believe they are important and should be unearthed from shoeboxes and drawers and given some love and put forth into the world as beautiful books. Each book is accompanied by a hand-printed letterpress bookmark. Tributes to the first African American professor at UNC-Chapel Hill who was a mentor to many students and colleagues in a long and storied career. Bill Price’s memoir of his year abroad serving in the Navy. I worked to restore old snapshots that Bill had been storing in a shoebox for decades. A family memoir with a principal focus on Reynolds Price, who became an a prolific writer and teacher with a long-lasting influence on hundreds of students. William offers the longest section of memoir through interviews conducted by James Clark. Some of the revelations include information never revealed by Reynolds Price in his own four memoirs about his family and himself. Also included are essays by Memsy Price (William’s elder daughter) and William’s portion of a project that Reynolds wanted them to pursue jointly. Numerous photographs augment the text. Louis Ford’s autobiography covers the events of his life—from his small-town upbringing, to traveling the world in the Merchant Marines and becoming a college professor and world-renowned expert in diesel engineering.